More than three million restaurant workers are injured in kitchen slips and falls each year, according to the National Floor Safety Institute. What’s worse, is that the number of kitchen falls is increasing by about 10 percent each year. If you own or manage a restaurant, you owe it to your employees—and your investors—to minimize the fall risk from wet and slippery floors. Commercial kitchen floor coatings from Prestige Floor Coating can help. Our commercial kitchen floor coatings are designed to withstand high traffic, high temperatures, spills, stains, and more. We manufacture our floor coating products in-house, so we can create a product that fits your own unique needs and preferences. Our products are VOC free, meaning our floor coatings will release no harmful chemicals into your restaurant kitchen. Give us a call at (443) 519-2628 or contact us online today to learn more or to request an estimate! Should I Coat My Commercial Kitchen Floor? Our commercial kitchen floor coatings use our unique chemical product that is designed by our in-house chemists. Our product bonds with the molecules on a concrete floor, creating a single, durable floor, not just a layer on top of your existing floor. In addition, our floor coating is impenetrable and has a rough sand-like texture that will help prevent falls and injuries. Its elastic properties allow it to expand to 600% of its original size, making cracks and tears virtually impossible. We’re so confident in our commercial floor coating product that we offer a two-year guarantee. If your floor cracks or peels within that time frame, we’ll replace the entire floor. An epoxy floor coating on your commercial kitchen floor can last—and look lovely—for decades. Give us a call today to schedule your appointment at (443) 519-2628. 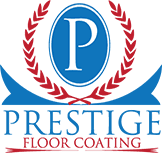 Prestige Floor Coating has been helping business owners create beautiful and durable floors for more than 16 years. Over that time, we have helped more than 40,000 customers and applied more than 30 million square feet of floor coating material. You can rest easy knowing that your commercial kitchen floor is in safe hands, and so is the safety of your staff and employees. To learn more about how Prestige Floor Coating can help you with your commercial kitchen flooring needs in VA, MD, PA, or DE, contact us online or give us a call at (443) 519-2628.